The National Thoroughbred Racing Association Top Thoroughbred Poll can claim a new leader as champion filly Monomoy Girl (11 first-place votes) earned 339 points to take over the top spot from multiple Grade 1 winner City of Light. Champion sprinter Roy H (317 points) also moved up one spot to second place as City of Light, who retired following his victory in the $9 million Pegasus World Cup Invitational on Jan. 26, fell to third with 280 points despite garnering 28 first-place votes. Pegasus World Cup Turf Invitational winner Bricks and Mortar (two first-place votes, 251 points) is fourth with Grade 1 winner McKinzie (one first-place vote, 187 points) fifth. Midnight Bisou (176 points) joins the Top 10 in sixth off the strength of her victory in the Grade 2 Azeri Stakes followed by Seeking the Soul (143) and champion turf female Sistercharlie (121). Marley’s Freedom and Accelerate tied for ninth with 72 points apiece. 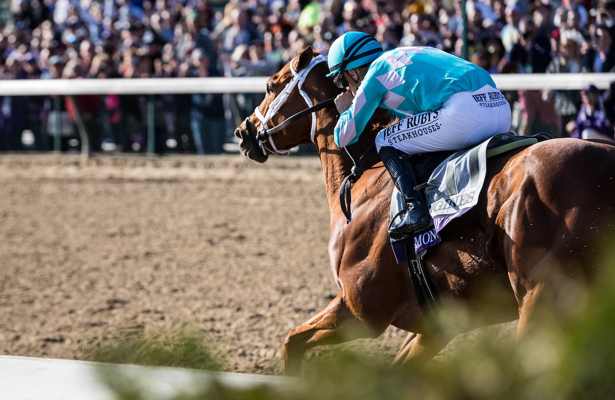 The NTRA Top Thoroughbred Poll concludes Nov. 4 after the running of the Breeders’ Cup.